Situated in the Nubian Desert on the banks of the Nile River in Aswan, Egypt, Sofitel Legend Old Cataract Aswan is an oasis reminiscent of a legendary dream. Blending historic significance with a stunning setting across Elephantine Island and unrivaled, luxury accommodations, the hotel is a destination unto itself. Dating back to 1899, the venerable Old Cataract's very name was inspired by the marriage of the river and the granite wall that forms the first cataract of the Nile. Recently updated, Sofitel Legend Old Cataract Aswan French entrusted interior designer Sybille de Margerie to restore the elusive grandeur while conserving the original beauty of the 19th-century Victorian building. Preserving the soul and splendor of the grand hotel, Sybille de Margerie successfully maintained the architectural integrity of the hotel, perfectly blending Victorian, Oriental, and French styles while updating the facade with a contemporary interpretation. 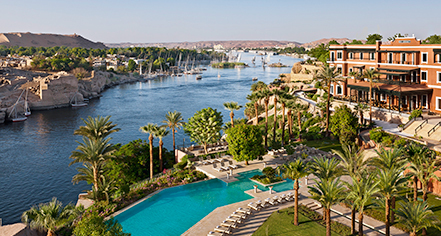 Boasting 220 luxurious accommodations, including 82 stunning suites, Sofitel Legend Old Cataract Aswan offers the ultimate Egyptian retreat, affording magnificent hospitality, and luxurious facilities, including an indulgent spa, fine dining establishments, and world-class meeting venues. 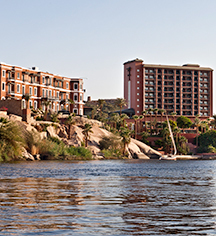 Sofitel Legend Old Cataract Aswan, a charter member of Historic Hotels Worldwide since 2014, dates back to 1899. The captivating atmosphere of the hotel inspired Agatha Christie’s Death on the Nile. Situated in the Nubian Desert on the banks of the Nile River in Aswan, Egypt, Sofitel Legend Old Cataract Aswan is an oasis reminiscent of a legendary dream. Blending historic significance with a stunning setting across Elephantine Island and unrivaled, luxury accommodations, the hotel is a destination unto itself. Learn more about the History of Sofitel Legend Old Cataract Aswan .